SpaceX and NASA will target Jan. 7 for the long-awaited uncrewed demonstration flight of the company's Crew Dragon spacecraft to the International Space Station, a critical mission that will pave the way for future flights from American soil. 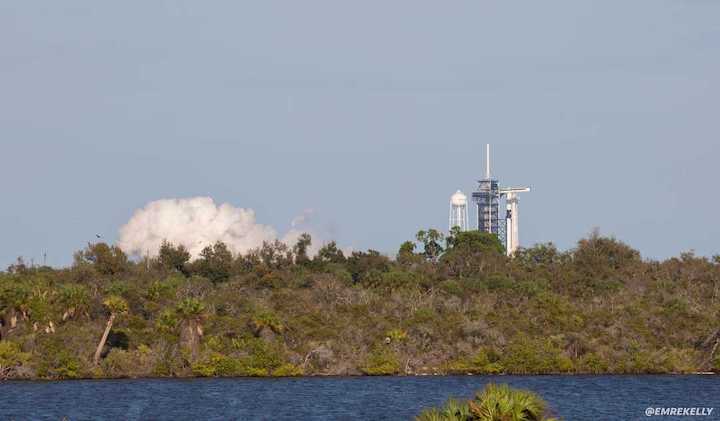 Kennedy Space Center's pad 39A, once used for Apollo and space shuttle launches, will host a Falcon 9 rocket for the mission designed to run the gamut from launch to docking to splashdown operations, NASA said Wednesday. Teams are expected to use the data and experience for SpaceX's first crewed demonstration flight, also from pad 39A, now slated for no earlier than June. That will mark nearly eight years since the last crewed mission took flight from U.S. soil on board Space Shuttle Atlantis. Bob Behnken and Doug Hurley will be the first astronauts to cross a futuristic new 85-foot walkway at the pad and board Crew Dragon for the crewed test flight, later followed by Victor Glover and Mike Hopkins for the capsule's first operational mission to the ISS. NASA's program established to help commercial companies deliver astronauts to the ISS, known as Commercial Crew, also selected Boeing as part of its $6.8 billion first round. The company is now expected to fly its Starliner capsule without a crew in March and will target a crewed mission in August if all goes well. Boeing's astronauts include Eric Boe, Josh Cassada, Chris Ferguson, Nicole Mann and Suni Williams. NASA's announcement of the Jan. 7 target launch, however, came less than a day after a report filed by The Washington Post said the agency ordered a safety review of SpaceX and Boeing that would delve into the "culture of the workplaces." The report said the probe was triggered, at least in part, by SpaceX CEO Elon Musk's recent behavior on "The Joe Rogan Experience" podcast that was streamed online. In it, Musk is seen sipping on whiskey and taking a single hit of marijuana. A NASA spokesman declined to tell the Post exactly what prompted the review. Back on the launch manifest, meanwhile, SpaceX still has four more missions to complete before 2018 is out: Two from Vandenberg Air Force Base in California and two from Cape Canaveral Air Force Station. The first of those, labeled SSO-A, is slated to launch from Vandenberg no earlier than Nov. 27 and will mark the first time the company attempts to fly the same booster three times. 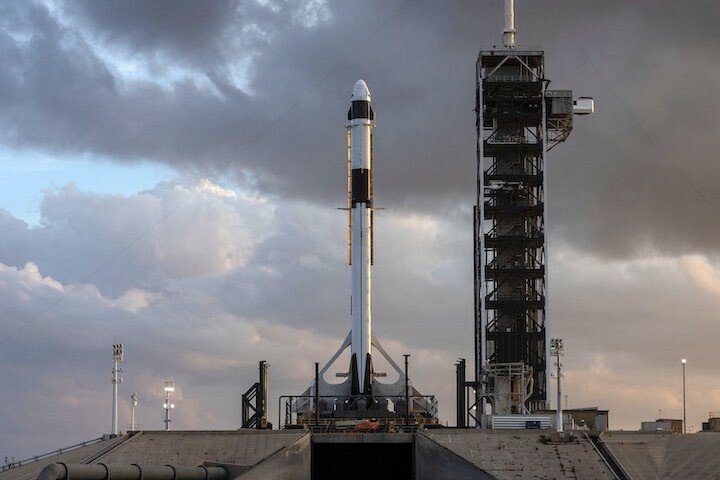 A week later on Dec. 4, a Falcon 9 will take thousands of pounds of cargo and science experiments to the ISS, launching from Cape Canaveral at 1:38 p.m.
SpaceX’s Falcon 9 rocket and Crew Dragon spacecraft arrived at launch pad 39A on Thursday morning. Credit: Spaceflight Now. SpaceX rolled out the company’s first space-worthy Crew Dragon spacecraft and its Falcon 9 launcher to pad 39A at NASA’s Kennedy Space Center in Florida for the first time Thursday, beginning a series of fit checks before the commercial spaceship takes off on its first orbital test flight. Shrouded in off-and-on fog, the Falcon 9 rocket and Crew Dragon capsule emerged from SpaceX’s hangar at the southern perimeter of launch pad 39A shortly after 7 a.m. EST (1200 GMT) Thursday for the quarter-mile trip up the ramp to the former Saturn 5 and space shuttle launch complex. The rocket was raised vertical just before 5:30 p.m. EST (2230 GMT). The first of two Crew Dragon orbital test flights could take off later this month — without astronauts on-board — on a trek to the International Space Station. If the test flight — named Demo-1 — and an abort test in the coming months go well, SpaceX could be ready to launch a pair of NASA astronauts to the space station on a second demonstration flight by the middle of the year. NASA is paying SpaceX $2.6 billion to develop the Crew Dragon spacecraft, conduct the two test flights, and begin regular crew rotation missions to the space station, perhaps as soon as late this year. Boeing is working on its own human-rated commercial spacecraft, named the CST-100 Starliner, under a $4.2 billion contract with NASA for missions that will blast off on United Launch Alliance Atlas 5 rockets. NASA’s commercial crew program is aimed at restoring U.S. human spaceflight capability to low Earth orbit for the first time since the space shuttle’s retirement in 2011, ending the agency’s reliance on Russian Soyuz spacecraft to send astronauts to and from the space station. The most recent official target launch date for SpaceX’s Crew Dragon Demo-1 flight released by NASA was Jan. 17. But that launch date was announced last month, and the Demo-1 mission’s launch is now widely expected some time after Jan. 17. The launch of Boeing’s first CST-100 test flight to low Earth orbit is expected later this year. It was most recently officially targeted for March, but that schedule is now out-of-date, and NASA has not provided a revised timeframe for the mission. A funding lapse affecting many U.S. government agencies, including NASA, could further delay the start of commercial crew test flights. NASA officials are responsible for numerous safety and certification reviews of the SpaceX and Boeing crew capsules before the test flights can go ahead, including evaluations of technical issues — such as parachute problems — faced by both companies. 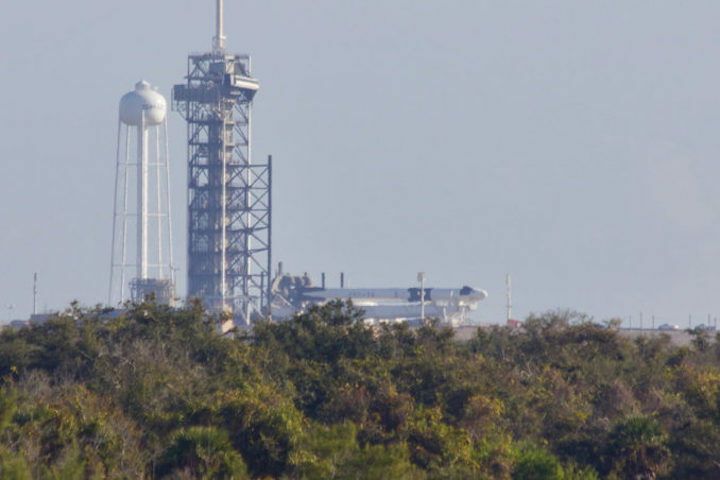 Nevertheless, Thursday’s rollout of the Falcon 9 rocket with the Crew Dragon spacecraft is a visible milestone for SpaceX and NASA. Activities planned at pad 39A in the coming weeks are expected to include fueling demonstrations and a test-firing of the Falcon 9’s first stage engines. 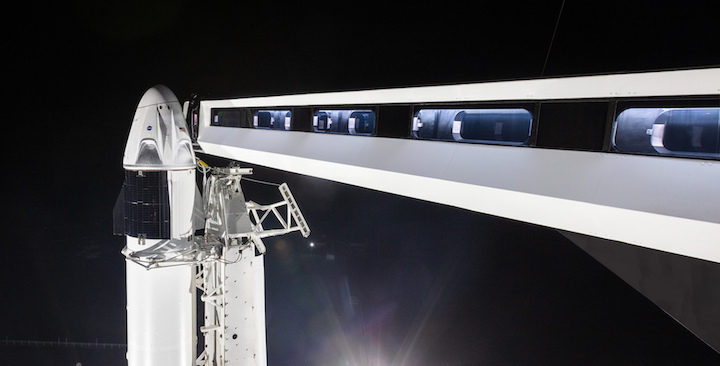 SpaceX has outfitted pad 39A for crew launches in recent months, including the installation of a crew access arm for astronauts to board the company’s capsule on top of the Falcon 9 rocket. The crew access arm is also expected to be exercised in the coming weeks with the Crew Dragon spacecraft at the pad. SpaceX's Crew Dragon spacecraft appears for the first time atop a Falcon 9 rocket at Kennedy Space Center's pad 39A on Thursday, Jan. 3, 2019. The SpaceX hardware tasked with flying a highly anticipated demonstration mission later this month made its first appearance at Kennedy Space Center on Thursday. 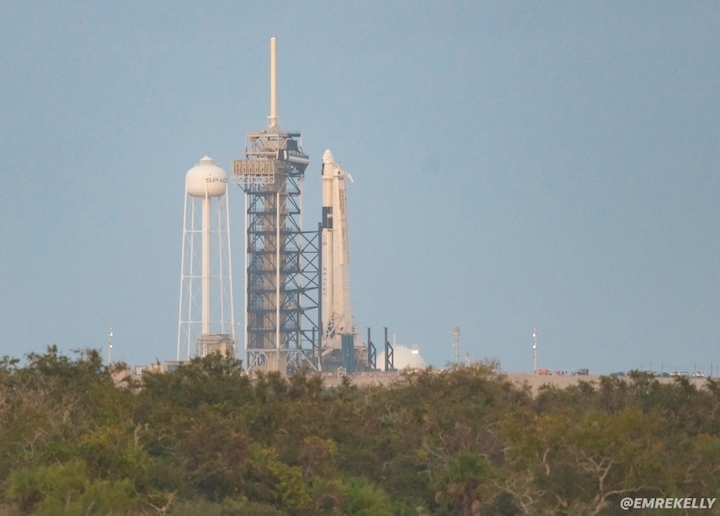 The company's Crew Dragon spacecraft, mated to the top of a brand new Falcon 9 booster, rolled out in a horizontal configuration to pad 39A just before 10 a.m. as teams continued preparations toward an uncrewed demonstration flight slated for no earlier than Jan. 17. SpaceX teams typically perform a variety of tests and checkouts at the pad before launching rockets. These range from the visible test fires before every launch to fit checks, which make sure the rocket's hardware aligns properly with ground equipment at the pad. 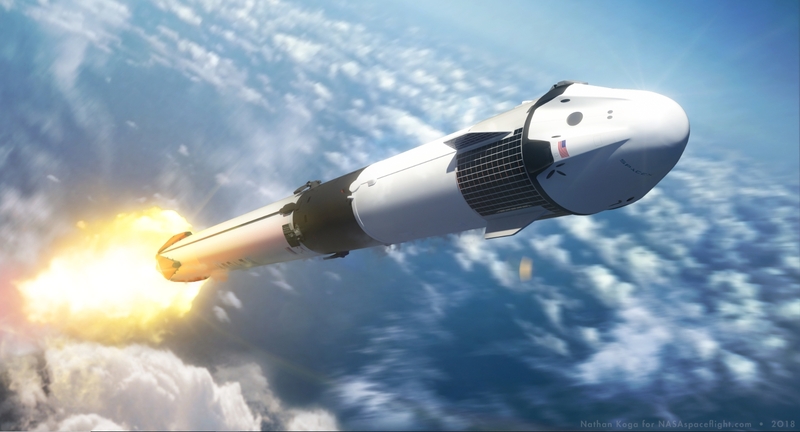 In the case of high-profile missions with new vehicles such as Crew Dragon, teams will have to adapt to new hardware as well as NASA requirements. The rocket and spacecraft went fully vertical at the pad by 5:30 p.m. The Jan. 17 timing of the mission, however, could be impacted by the ongoing government shutdown, which has furloughed a majority of NASA's workforce. SpaceX is flying the mission under NASA's Commercial Crew Program, an initiative designed to return astronauts to the International Space Station from U.S. soil – an accomplishment not seen since the end of the space shuttle program in 2011. Before Commercial Crew spacecraft can fly with astronauts, the program requires that both contractors – SpaceX and Boeing – fly uncrewed demonstration flights to the ISS. If successful, both companies will fly a second demonstration mission with crews. In between uncrewed and crewed flights, both will also have to conduct abort system tests, which are designed to propel astronauts away from rockets in the event of a launch failure. After the demonstration flights and reviews of data, both will be able to proceed with the first operational missions. Astronauts have already been selected for those. Beyond Commercial Crew, the next launch for the Eastern Range will be hosted at United Launch Alliance's Launch Complex 37. A Delta IV rocket will vault the Air Force's 10th and final Wideband Global SATCOM satellite, or WGS-10, to orbit. 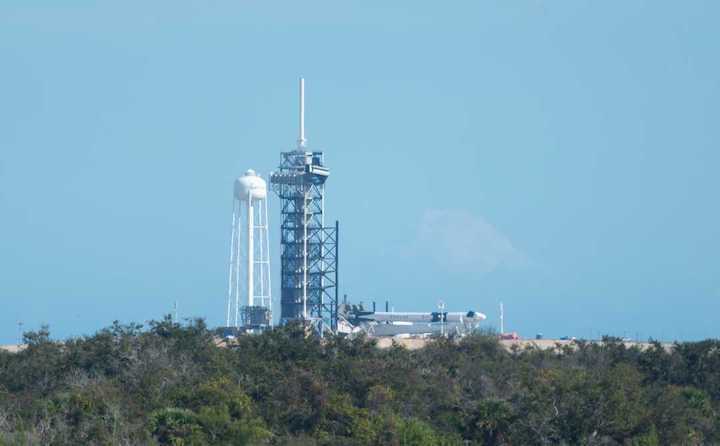 The SpaceX Falcon 9 and Crew Dragon capsule which will execute the Demonstration Mission-1 (DM-1) test flight have rolled out to Pad 39A for fit checks ahead of launch. The rollout is a strong indicator that SpaceX is nearly ready to perform the much anticipated DM-1 mission – an uncrewed certification flight for NASA’s Commercial Crew Program. The flight will be the first for SpaceX’s Crew Dragon aboard the Falcon 9 launch vehicle. Consequently, SpaceX has decided to perform additional fit checks with the fully integrated stack prior to launch. Preparations for the rollout began during the first half of December, with the Crew Dragon capsule being moved to the Horizontal Integration Facility (HIF) at Pad 39A for integration with the Falcon 9 launch vehicle. On December 20th, the Transporter Erector (T/E) – used to both transport and launch the rocket – went horizontal after picking up the reaction frame at the base of the launch pad. This is one of the final steps required before the rocket is integrated with the T/E for transport to the launch pad. Over the holiday period, the integration occurred with the Falcon 9 and Crew Dragon capsule being mated to the T/E inside of the HIF. Finally, Thursday saw the fully integrated stack rollout to Pad 39A for the first time. 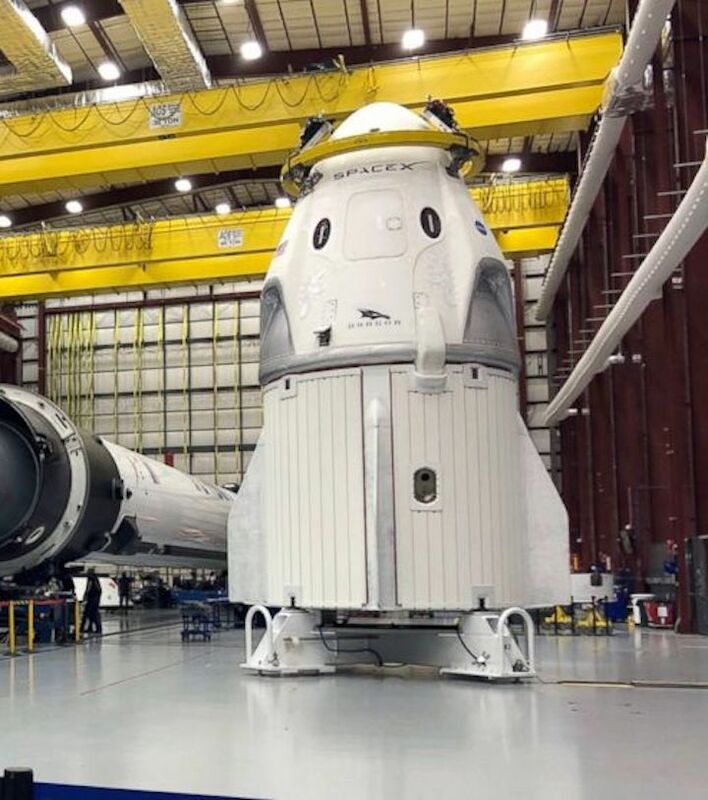 While the exact nature of the fit checks are not known, they will likely involve the new hardware which has been added to support Crew Dragon. 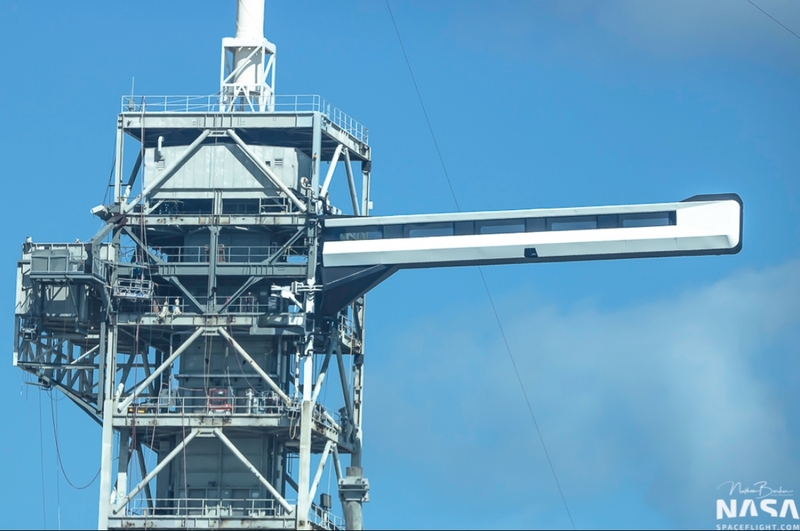 Most notably, the Crew Access Arm was outfitted to the pad’s Fixed Service Structure earlier this fall. The Crew Access Arm is similar to a jetway at an airport – providing crews with an entrance to the vehicle. The tip of the T/E which is used for Dragon missions has also been modified. The new hardware is designed to allow for clearance with the Crew Access Arm. Additionally, it is understood that the rollout is a dry simulation and thus will not include any propellant. However, a static fire test including propellant load and a short burn of the first stage’s nine Merlin engines will occur at a later date. The launch is expected to slip past the latest official no-earlier than launch date of January 17th. Many aspects of the launch campaign require NASA oversight and thus cannot proceed without NASA’s approval. It is understood that each additional day of the government shutdown translates into about a one day delay with the launch. The DM-1 launch will feature the first stage B1051 – a brand new Block 5 Falcon 9 with upgraded composite overwrapped pressure vessels (COPVs). The rocket’s second stage will also include the upgrade. Barring significant delays, DM-1 will become the second launch to sport the upgraded COPVs in both stages – with the first being GPS III SV01 in December, 2018. The enhanced COPVs are designed to improve safety over the previous version which was blamed for the AMOS-6 explosion in 2016. To satisfy NASA’s safety concerns, SpaceX will load the propellant during the DM-1 static fire and launch as if it were a crewed flight. These rehearsals will then be repeated for the in-flight abort static fire and launch and the DM-2 static fire and launch. Unlike other crewed launch vehicles such as the Space Shuttle, SpaceX will load the propellant after loading crew in a process known as load and go. Therefore, it is especially important to avoid any incidents during the fueling process. The DM-1 mission will also be the first time a Dragon will perform a docking with the International Space Station. Previously, cargo Dragons have been captured and berthed by the robotic Canadarm2. However, Crew Dragon will autonomously dock and undock with the Station. While in space, SpaceX will use their new Boca Chica tracking site to monitor Crew Dragon. The site features two tracking dishes which SpaceX took over from NASA. Boca Chica was recently used to track the Falcon 9’s second stage during the GPS III SV01 mission, a sign that the tracking station is ready for the DM-1 launch. Following a two week stay at the Space Station, Crew Dragon spacecraft is expected to splash down in the Atlantic Ocean. This will be the first time that SpaceX has landed a capsule on the east coast. In the past, the Dragons have landed in the Pacific. The Crew Dragon capsule will be recovered by SpaceX’s GO Searcher vessel, which has recently undergone upgrades to prepare it for Crew Dragon recoveries. The recovery process during DM-1 will be critically important, with the Crew Dragon vehicle needing to be reflown again during the subsequent in-flight abort test. How quickly the capsule can be refurbished after a dip in the corrosive salt water is seen as one of the critical path elements for SpaceX’s certification for crewed flight. 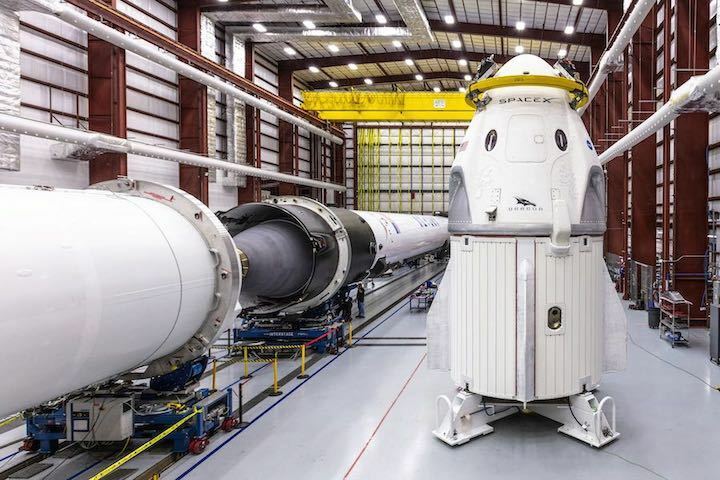 The in-flight abort test will see a Falcon 9 and a dummy second stage launch the Crew Dragon capsule. Crew Dragon will then perform an abort maneuver during first stage flight – demonstrating a critical crew safety feature. The abort test must occur before SpaceX’s crewed DM-2 test flight. DM-2 is currently scheduled to occur no earlier than this summer. Ground teams at NASA’s Kennedy Space Center in Florida rolled the Falcon 9 rocket and Crew Dragon spacecraft to pad 39A on Thursday, Jan. 3, then hydraulically lifted the launcher vertical for a series of fit checks at the seaside launch facility, which was once used to launch Saturn 5 moon rockets and space shuttles. SpaceX lowered the Falcon 9 rocket Friday evening, but the booster was expected to soon return to its launch pedestal for further testing, including a countdown rehearsal and a fueling test to practice launch day procedures. A hold-down firing of the Falcon 9’s Merlin main engines is also on tap before the mission is ready to fly. “Early flights are especially dangerous, as there’s a lot of new hardware,” Musk wrote. The Crew Dragon spacecraft is a privately-developed, SpaceX-owned capsule NASA aims to use to ferry U.S. astronauts to and from the International Space Station, ending the space agency’s sole reliance on Russian Soyuz spacecraft for crew transportation to the orbiting research laboratory. 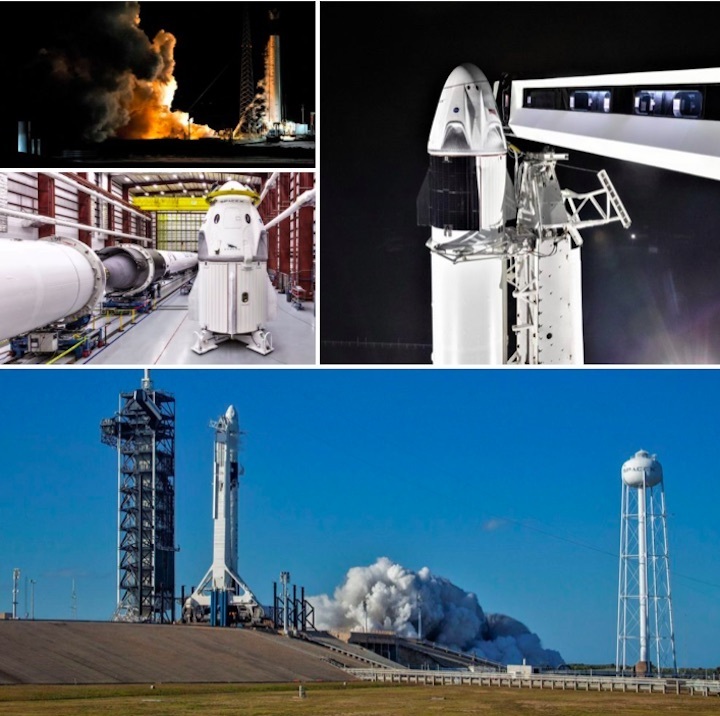 NASA signed a $2.6 billion contract with SpaceX in 2014 to design, develop and fly the Crew Dragon spacecraft, and the agreement covers the two test flights — Demo-1 without astronauts and Demo-2 with astronauts on-board — and six operational crew rotation flights to the station once NASA reviews the results of the demonstration missions. NASA has a similar $4.2 billion contract with Boeing for development of the CST-100 Starliner spacecraft, which will launch on United Launch Alliance Atlas 5 rockets, also from Cape Canaveral. The Crew Dragon’s Demo-1 mission will launch aboard the Falcon 9 rocket into low Earth orbit, and rendezvous with the space station around 250 miles (400 kilometers) above Earth, moving in for an automated docking, a first-time achievement for SpaceX. The company’s current Dragon cargo capsules are grappled by the station’s robotic arm. The Crew Dragon — also called Dragon 2 — represents a brand new spacecraft design, with new life support systems, crew accommodations, and propulsion, electrical and thermal control systems not used on the previous Dragon vehicles. For example, the Crew Dragon features powerful hydrazine-fueled SuperDraco thruster pods that could be used to drive the capsule away from a failing launch vehicle. The spacecraft’s rear trunk section also has solar panels mounted on the outer mold line, and a thermal radiator to keep the craft’s temperature within limits. Crew-carrying Dragons will also have seats and an astronaut control panel. A funding lapse affecting many U.S. government agencies, including NASA, may force delays in the commercial crew test flights.. NASA officials are responsible for numerous safety and certification reviews of the SpaceX and Boeing crew capsules before the test flights can go ahead, including evaluations of technical issues — such as parachute problems — faced by both companies. While SpaceX can proceed with launch preparations at the Kennedy Space Center, some of the reviews require the participation of furloughed NASA employees, such as managers responsible for ensuring the spacecraft meets the agency’s requirements, and officials in charge of the space station program, the capsule’s destination. After a few weeks in orbit, the Crew Dragon will undock from the space station and parachute to a splashdown at sea. If the flight goes well, NASA astronauts Doug Hurley and Bob Behnken could take their seats on the second Crew Dragon test flight to the space station as soon as this summer. SpaceX founder Elon Musk announced this weekend that the first, "especially dangerous" test flight of the commercial crew program still is a month away, suggesting yet another delay on the project. "About a month away from the first orbital test flight of crew Dragon," Musk tweeted Saturday of the demonstration flight — meaning, without humans onboard — most recently scheduled for Jan. 17. Musk on Twitter did not elaborate on the cause of the apparent delay. SpaceX declined to comment for the story. But the Twitter update comes as the federal government shutdown stretches well into the double digits. About 16,700 NASA employees, or 96 percent of the workforce, are impacted by the shutdown that started Dec. 22 as President Donald Trump held firm on his demands that Congress fund a border wall between the U.S. and Mexico. SpaceX launches are conducted on NASA-owned launch pads in Cape Canaveral, Fla. so government shutdown-related delays are nothing new for the company. The January 2018 shutdown, for example, forced SpaceX to delay the 12-second test firing of its Falcon Heavy rocket, which Musk hopes will one day take humans to Mars. But Musk's tweet appears to represent yet another setback for the commercial crew program, which has struggled to get off the ground since SpaceX and Boeing were tapped in 2014 to build commercial vehicles that can transport NASA astronauts to and from the International Space Station. The program was started in an effort to alleviate the U.S.'s dependence on Russia for transporting astronauts to the orbiting laboratory. NASA has relied on Russia for this service since the Space Shuttle program was shuttered in 2011. The two companies initially were expected to launch crewed test flights in 2018, but like many space-related programs, their schedules have slipped. Now, SpaceX plans to launch an uncrewed flight test — apparently — in February, with a crewed flight test in June. Boeing's changes are similar, with an uncrewed flight test in March and crewed flight test in August. But a NASA safety panel in October released a report calling into question both companies' timelines and construction. For example, it found that Boeing still has not completed several important tests on the parachute systems, heat shield and other components of the spacecraft. It also found that SpaceX was struggling with the parachute system. The companies' schedules to fly "have considerable risk and do not appear achievable given the number of technical issues yet to be resolved," the panel. Also this weekend, Musk tweeted an acknowledgement that the upcoming launch is "extremely intense." "Early flights are especially dangerous, as there's a lot of new hardware," he wrote. 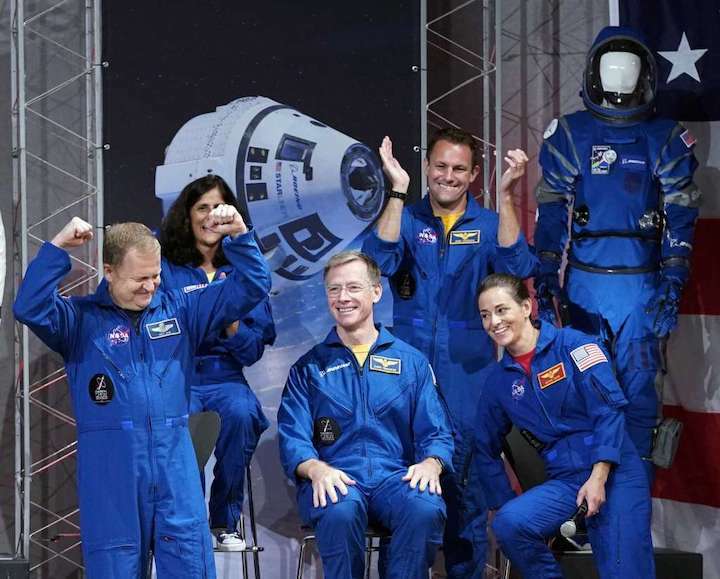 Despite these delays, NASA already has announced the nine astronauts who will be the first to fly on Boeing and SpaceX vehicles. In the midst of several confusing delays, schedule updates, and official statements, the orbital debut of SpaceX’s Crew Dragon spacecraft has made its way onto the Eastern range’s planning schedule for the first time, placing Falcon 9 B1051’s static fire and Crew Dragons launch no earlier than (NET) January 23rd and February 9th, respectively. As the brand new spacecraft’s first attempted trip to orbit, the demonstration mission (Demo-1/DM-1) will be performed without crew aboard, allowing SpaceX and NASA an opportunity to fully verify performance and explore Crew Dragon’s capabilities without risking the lives of the astronauts that will step inside a nearly identical vehicle as early as June or July. The US government has been shut down for more than four weeks as a consequence of the inability of elected representatives to pass and sign a funding bill, now the longest shutdown in the country’s history. As a result, more than 95% of NASA’s workforce has been furloughed, leaving around 800 people left working (without pay) across the agency in positions or groups deemed absolutely essential to avoid loss of life or property damage. How NASA defines “essential” is unknown but it seemed improbable that the Commercial Crew Program – around six months away from actually launching astronauts and presently marked by NASA’s attempts to complete reams of approval and certification paperwork – would fall under that extremely narrow umbrella. Delays to Crew launches are unlikely to harm hardware or directly risk harm to astronauts, although a very tenuous case could be made that delays to the program now would snowball and cause the debut of operational crewed launches to slip so far into 2019 (or even 2020) that NASA could lose assured access to the International Space Station (ISS) for several months. Again, there is no obvious way that a slip like that would actually increase the risk to life or limb for astronauts and hardware/infrastructure. Despite the logical improbability that NASA’s Commercial Crew Program (CCP) would – at this point in time – remain operating at full capacity during an extended government shutdown, NASA provided a statement to The Atlantic earlier this week more or less implying that CCP was deemed essential and has continued to operate for the last several weeks. There is certainly some wiggle room in NASA spokesman Bob Jacobs’ comments, enough to make it ambiguous if they are primarily PR spin, frank honesty, or something in between. A SpaceX spokesperson added [paraphrased by The Atlantic] that “if NASA made the call, the company would carry out the uncrewed [DM-1] launch”, a tactical nonanswer that redirects the impetus to NASA. It’s not clear if the people at NASA that would ‘make the call’ to launch are furloughed or not – they certainly would not be essential in the sense described by NASA’s own overview of the current shutdown’s impact. Originally targeting a launch sometime in mid to late January, an official NASA update posted on January 10th showed that Crew Dragon’s first launch had slipped into February (on the launch range for February 9th). f SpaceX completes its NET January 23rd static fire with no problems, then it would appear to be the case that some sort of SpaceX-side delay – perhaps augmented or slowed down by NASA operating at 5% capacity – caused the slip from mid-January to mid-February. Stay tuned to find out! 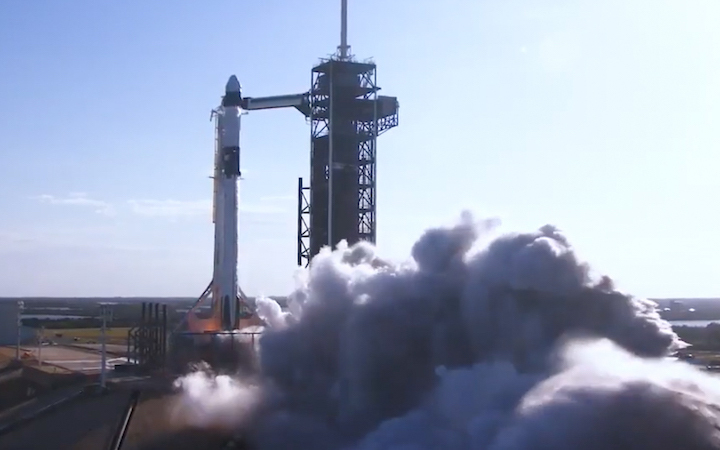 A SpaceX Falcon 9 rocket topped with a Crew Dragon spacecraft rumbled to life at Kennedy Space Center on Thursday, paving the way for the company to conduct an uncrewed demonstration flight as soon as February. At 4 p.m., the flames produced by nine Merlin main engines scorched the trench at pad 39A and brought an end to the test conducted before every SpaceX launch. Teams will evaluate the data and, if all looks free of error, move forward with launch planning. Thursday's test fire means teams are likely still targeting early to mid-February for the uncrewed flight destined to garner international attention and attract thousands to the Space Coast. SpaceX test fires its Falcon 9 rocket topped with the Crew Dragon spacecraft at Kennedy Space Center's pad 39A on Thursday, Jan. 24, 2019. Demonstration Mission-1, however, is believed to be dependent on the government shutdown, which is quickly approaching its fifth week. Most of NASA remains without a full-time workforce and is operating a skeleton crew to maintain the ISS and other critical programs. 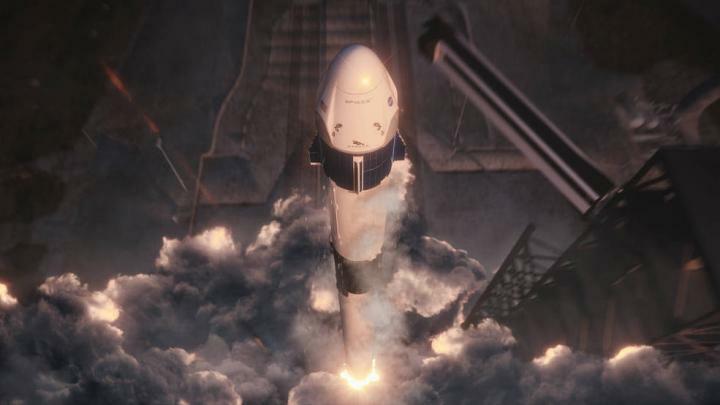 SpaceX has been tasked – along with Boeing – by NASA with launching its Crew Dragon spacecraft to the International Space Station. Before it can put humans on board, however, it must launch an uncrewed demonstration flight to the ISS and back. Boeing must do the same with its Starliner. If all goes according to plan, SpaceX and Boeing are targeting June and August, respectively, for their crewed flights. Astronauts have already been selected. SpaceX conducted a long-awaited Static Test Fire yesterday (Jan 24) of the Falcon 9 rocket which will soon launch their first Crew Dragon from Florida, marking the first time a crewed vehicle and ground systems have been integrated together on pad 39A since space shuttle Atlantis last soared on the STS-135 mission almost 8 years ago. With the milestone pre-flight test complete, both SpaceX and NASA are pressing onward for a ‘no earlier than’ late February liftoff and moving the nation a giant leap closer to its first commercial crew launch. Rockets launching off Cape Canaveral will soon grace the Space Coast for the first time this year as SpaceX is scheduled to launch its Falcon 9 rocket for Indonesian satellite operator PT Pasifik Satelit Nusantara (PSN) and Israeli nonprofit SpaceIL on Thursday, Feb. 21. But even more exciting than the return of launches is perhaps the long-awaited demonstration flight of SpaceX's Crew Dragon and Falcon 9 test flight. With rocket launches resuming this week since a temporary hiatus, Kennedy Space Center Visitor Complex released their special viewing opportunity packages for guests to witness the uncrewed test flight. Commercial aerospace companies, SpaceX and Boeing partnered with NASA to once again send astronauts to the International Space Station from U.S. soil, something that hasn't been done since 2011. Providing the closest viewing opportunities to see a rocket launch, the visitor complex is not only planning on giving guests an out-of-this-world experience for this momentous occasion, but will be giving them a VIP experience. Guests can choose from two packages: "Feel the Heat" and "Feel the Fun." Tickets can be purchased at the visitor complex's website at kennedyspacecenter.com. NASA's Commercial Crew Program will be the first time commercially-built and operated American spacecraft designed for humans dock on the space station. Before any crewed missions occur however, both SpaceX and Boeing must conduct uncrewed flight tests to ensure they are ready for subsequent crewed missions. SpaceX's Demo-1 flight test is scheduled no earlier than March 2, while Boeing's Orbital uncrewed flight test is slated no earlier than April. If the flight tests meet NASA's requirements, the world could see a crewed mission as early as July. It has been nearly a month since SpaceX conducted a Static Test Fire of the Falcon 9 rocket which will launch the first Crew Dragon, and today NASA provided some more details about the upcoming launch, Demo-1, which will send the spacecraft on an uncrewed orbital shakedown & validation flight test to and from the International Space Station. Launch of the highly anticipated mission from Kennedy Space Center launch complex 39A in Florida is scheduled for 2:48am EST on Saturday, March 2. This illustration depicts SpaceX’s Crew Dragon spacecraft and Falcon 9 rocket lifting off from historic Launch Complex 39A at NASA’s Kennedy Space Center in Florida. NASA will provide coverage of the upcoming prelaunch and launch activities for the SpaceX Demo-1 flight test to the International Space Stationfor the agency’s Commercial Crew Program, which is working with the U.S. aerospace industry to launch astronauts on American rockets and spacecraft from American soil for the first time since 2011. 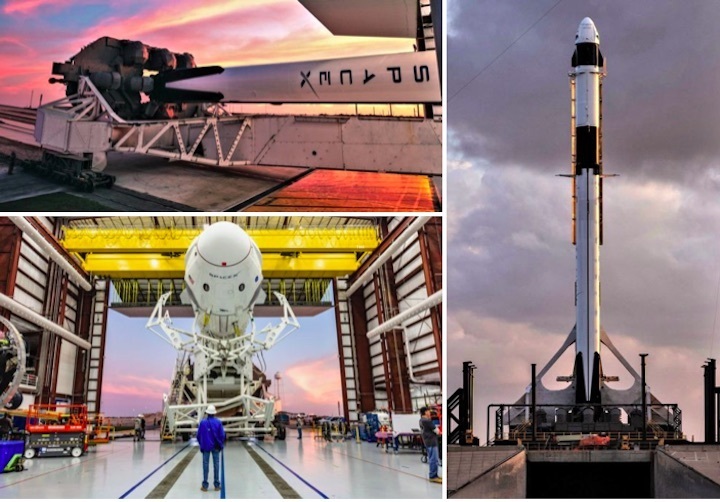 NASA and SpaceX are targeting 2:48 a.m. EST Saturday, March 2, for the launch of the company’s uncrewed Demo-1 flight, which will be the first time a commercially built and operated American rocket and spacecraft designed for humans will launch to the space station. The launch, as well as other activities leading up to the launch, will air on NASA Television and the agency’s website. The SpaceX Crew Dragon spacecraft will launch on a Falcon 9 rocket from historic Launch Complex 39A at NASA’s Kennedy Space Center in Florida. 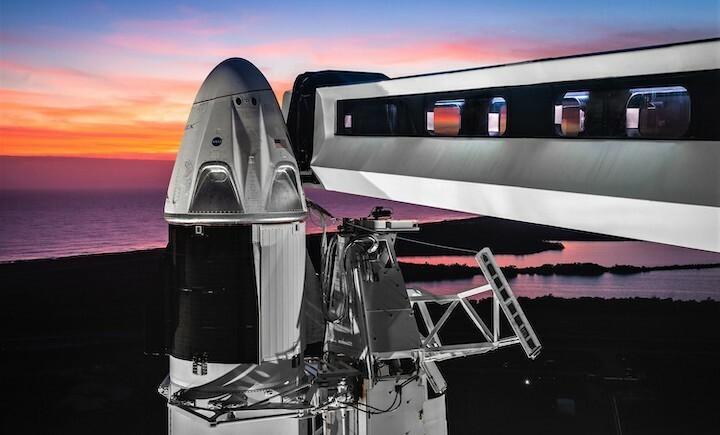 The Crew Dragon is scheduled to dock to the space station at approximately 5:55 a.m. Sunday, March 3. 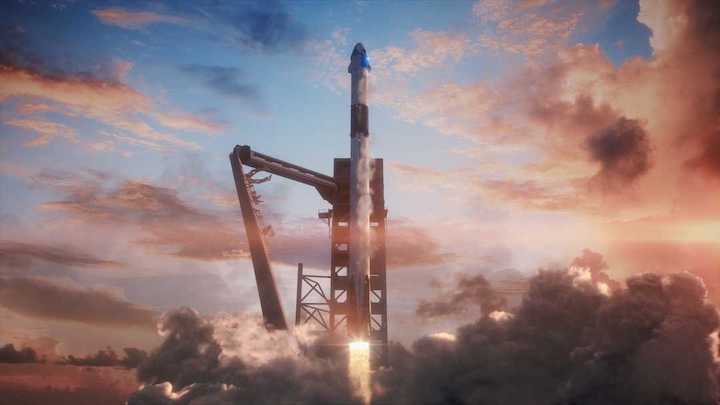 This will be the first uncrewed flight test of NASA’s Commercial Crew Program and will provide data on the performance of the Falcon 9 rocket, Crew Dragon spacecraft and ground systems, as well as in-orbit, docking and landing operations. The flight test also will provide valuable data toward NASA certifying SpaceX’s crew transportation system for carrying astronauts to and from the space station. SpaceX’s Demo-2 test flight, which will fly NASA astronauts to the space station, is targeted to launch in July. Following each flight, NASA will review performance data to ensure each upcoming mission is as safe as possible. After completion of all test flights, NASA will continue its review of the systems and flight data for certification ahead of the start of regular crewed flights to the space station. Although the chances of additional delays are high, the orbital launch debut of SpaceX’s Crew Dragon spacecraft remains stoically targeted for 2:47 am EDT (07:47 UTC) on March 2nd, less than ten days from today. Known as DM-1, the unproven SpaceX vehicle’s autonomous demonstration mission is a critical milestone along the road to assured US access to the International Space Station (ISS), without which NASA will be forced to continue procuring seats on Russian Soyuz missions with aggressively inflated price tags. If everything goes exactly as planned, a successful DM-1 could translate into the company’s first crewed launch as early as July 2019. Following a nominal mission plan, the first spaceworthy Crew Dragon will dock with the ISS a little over 24 hours after launch (March 3rd) with around 180 kg (400 lb) of cargo for the station’s six-astronaut crew. Five days later (March 8th), Crew Dragon will depart from the ISS, detach its expendable trunk, and reenter Earth’s atmosphere for a soft landing in the Atlantic Ocean. Throughout these operations, ISS astronauts, NASA technicians and operators, and a range of SpaceX employees will conduct extensive observations and tests of the new spacecraft’s performance during all mission phases, ranging from on-orbit docking (a new technology for SpaceX) to Atlantic Ocean recovery operations. Once the capsule has been extricated from the ocean, SpaceX’s spacecraft refurbishment technicians will be faced with an extraordinary challenge, upon which the date of Crew Dragon’s first crewed launch will directly hinge. 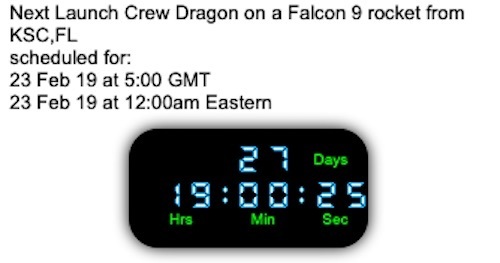 Assuming splashdown ops are nominal and Dragon is returned safely to Florida, it’s safe to assume that SpaceX will transport the spacecraft to its Hawthorne factory, at which point its engineers and technicians will have roughly two months to prepare it for another launch. Known as an in-flight abort (IFA) test, SpaceX specifically opted to perform the spacecraft safety check despite the fact that NASA did not explicitly require its commercial providers (Boeing and SpaceX) to do so. 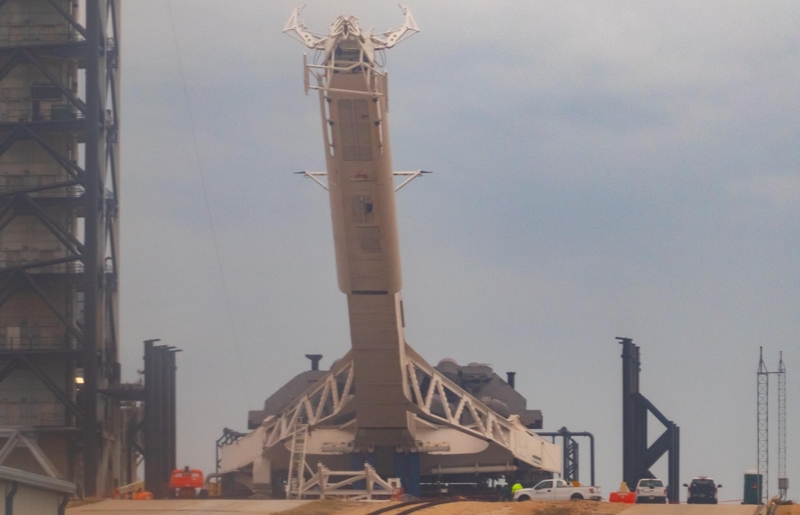 SpaceX completed Crew Dragon’s pad abort test – required by NASA – almost four years ago, while Boeing will not perform an in-flight abort before launching astronauts and has its pad abort scheduled no earlier than (NET) May 2019. SpaceX’s IFA test is designed to verify that Crew Dragon is capable of safely extricating its astronaut passengers from a failing rocket at the point of peak aerodynamic (and thus mechanical) stress during launch, known as Max Q. Combined with a pad abort demonstration, where the above situation is replicated but with the rocket and spacecraft motionless on the launch pad, the engineering assumption is that successful aborts at both standstill and Max Q verify that a given spacecraft has proven that it can essentially abort and carry astronauts to safety at any point during launch. Aside from a boilerplate Merlin Vacuum engine on the second stage, SpaceX’s IFA test is set to fly on real Falcon 9 hardware that will almost certainly be consigned to total destruction at the point of abort, around 90 seconds after launch. SpaceX’s decision to expend an entirely flightworthy Falcon 9 Block 5 rocket – featuring a booster capable of supporting anywhere from 5-100 lifetime missions – is a tangible demonstration of the company’s commitment to crew safety above all else, although NASA will either partially or fully compensate SpaceX for the milestone. 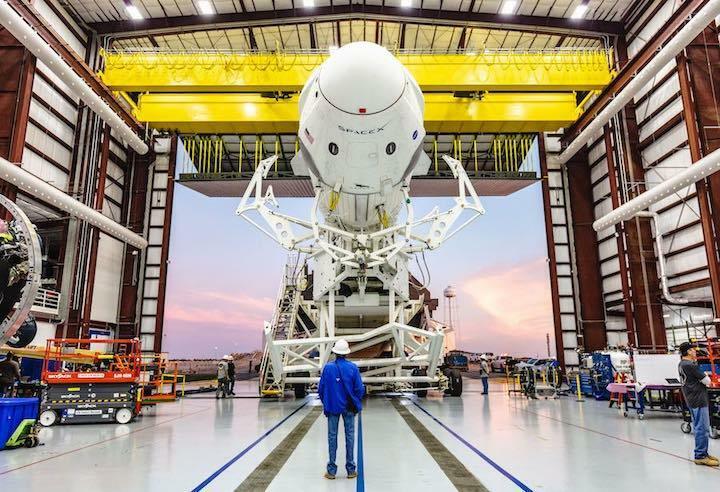 Set to occur no earlier than June 2019, the IFA schedule is explicitly constrained by the successful launch and recovery of Crew Dragon after DM-1 – any delays to that mission will likely translate into IFA delays, which will translate into delays for the first crewed mission (DM-2).